Far more men than women are reporting the news, at least at some of the most prominent news organizations in the United States. At ABC’s World News Tonight, 88 percent of the on-camera and producer credits on stories went to men. At the New York Daily News, 76 percent of bylines were men’s. Those are a few of the numbers from the Women’s Media Center 2017 study released recently, which tracked reporting from broadcast, wire, newspaper, and digital-only outlets for three months in 2016. The study analyzed bylines, on-air anchor and correspondent appearances, and producer credits on 24,117 news pieces produced between September and November of last year by four broadcast TV outlets, 10 newspapers, four digital outlets, and two major wire services. Across all platforms, a gender gap persists, but the report found the starkest disparity in the TV news outlets it examined, where women — counting anchors and on-air correspondents — reported only a quarter of the news (down from the 32 percent found in WMC’s last report in 2015). PBS News Hour, which prior to Gwen Ifill’s death in November had two female co-anchors, was closest to achieving gender parity. 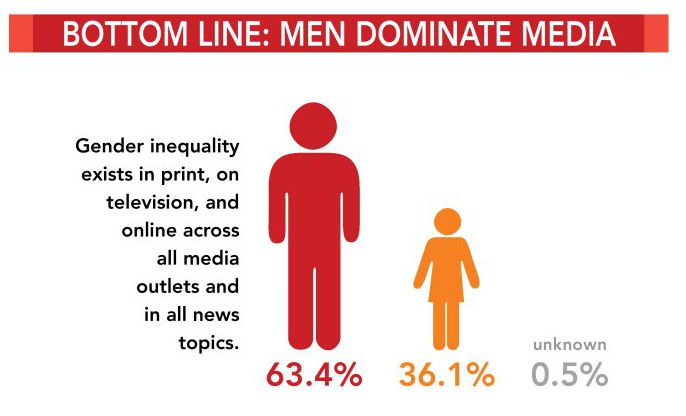 At the 10 newspapers analyzed, men reported 62 percent of the news and women 38 percent. The gender gap was smaller at the digital outlets analyzed, with women making up 46 percent of the bylines. The best performer: FoxNews.com, which finished at 50.1 percent men and 49.9 percent women. The imbalance was also reflected in the sources quoted in stories that touch on women’s lives. Women wrote 37 percent of stories around reproductive rights from the newspapers and wire services analyzed in the WMC report, versus 52 percent by men. (About 11 percent of stories analyzed had no byline, including unsigned editorials.) Men and women writing about reproductive issues quoted people differently, too: Women quoted other women in 42 percent of the quotes in those stories, while men quoted women in only 27 percent of theirs. A similar pattern emerged in stories about campus sexual assault. Men wrote 55 percent of the stories vs. 31 percent by women (the remainder having no byline). In the stories by men, 28 percent of the quotes were from women; in stories by women, 42 percent were.